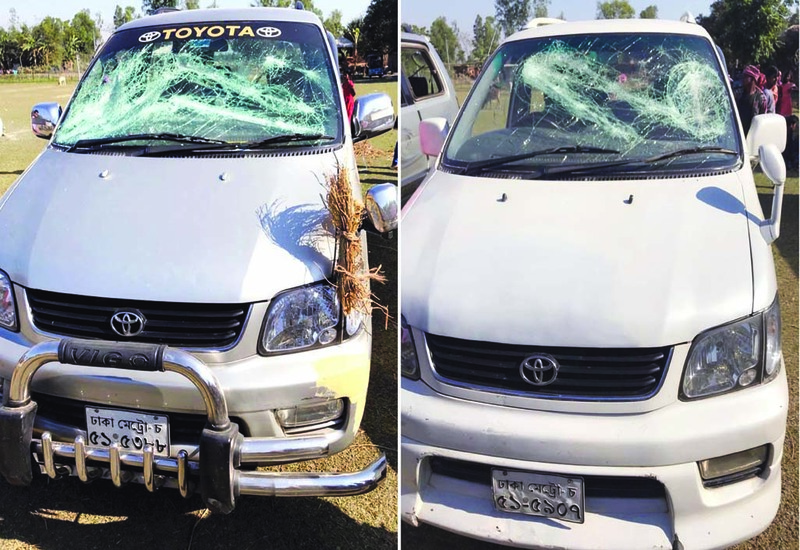 UNB, Thakurgaon :The motorcade of BNP secretary general Mirza Fakhrul Islam Alamgir came under attack at Danarhat in Sadar upazila on Tuesday noon on his way to the district town from Saidpur Airport, leaving at least 10 people injured.BNP district president Taimur Rahman alleged that a group of Awami League leaders and activists made the attack on Fakhrul's motorcade around 12:05 pm, damaging at least eight vehicles of the BNP leader's motorcade. Besides, he said, their party's 10-15 people were injured during the attack.However, Fakhrul managed to escape the attack unhurt. Talking to UNB, Fakhrul's personal secretary Mohammad Yunus said the BNP leader went to Saidpur Airport from Dhaka by air in the morning.On his way to the Thakurgaon district town, he said, the BNP secretary general went to Danarhat area to visit the houses of some BNP activists who were arrested by police on Monday night.Yunus alleged that some ruling party leaders, led by local UP Chairman Boni Amin, equipped with sticks took position behind a police van near a road crossing, and attacked Fakhrul's motorcadeÂ when it was passing through the area. He said, police played the role of a silent spectator instead of taking any step to resist the attackers. As the news of the attack spread, Yunus said several hundred local people rushed in, but Fakhrul pacified them and urged them to have patience.Â Yunus said, the BNP secretary general is scheduled to kick off his election campaign through a rally in Garoa area under Sadar upazila in the afternoon. Fakhrul is contesting the election from two seats-Thakurgaon-1 and Bogura in the 11th parliamentary elections.